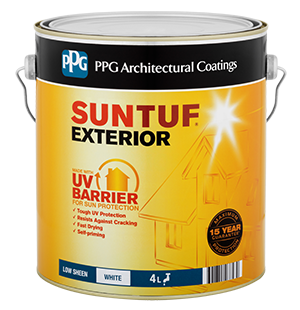 PPG Architectural Coatings SunTuf Exterior is a water-based, 100% acrylic exterior paint formulated to protect your home from the ageing effect of the sun's harmful UV rays. Resists colour fading and paint deterioration so your paint finish keeps its fresh new look for longer. SunTuf Exterior provides maximum protection for 15 years, guaranteed. Ensure surfaces to be painted are clean, dry and free of contamination, in hot and windy conditions or when painting very absorbent surfaces, dampen the surface with water before painting. Fill surface defects with suitable filler or sealant. Surface must be clean, dry and free from all dirt, dust, grease, oil, rust and any other surface contamination. Remove loose and flaking paint and sand surface thoroughly. On aged enamel use PPG Architectural Coatings 3 in 1 for intercoat adhesion. Treat bare areas as for new work. Timber - Sand weathered (greyed) timber to the original timber surface. 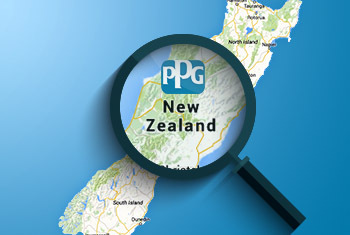 Tannin rich timbers should be primed with PPG Architectural Coatings 3 in 1. Galvanised Iron - Degrease new surfaces, thoroughly clean weathered surfaces to ensure adhesion. For structural galvanized iron, abrade with 240# paper to remove chemical treatments. If red dust is present, treat as for steel. Cement Render/Masonry - Allow masonry, cement render and mortar to cure for 28 days before painting. Confirm colour before use. Ensure adequate ventilation. Avoid painting in direct sun or windy conditions. Dampen highly absorbent surfaces. Disconnect drinking water pipes before painting roofs, reconnect after first rain. Apply using a brush, roller or spray. Use two generous coats and three on unpainted surfaces. Stir paint with a 25mm wide flat stirrer in a circular lifting motion for at least 5 minutes before use.